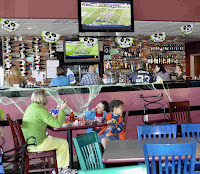 Shores, located in Birch Bay’s Sandcastle Resort, is a family restaurant/sports bar. That makes for a mixed dynamic: sporadically raucous team fans competeing with youngsters who have neglected to leave their “outside voices” at the door. 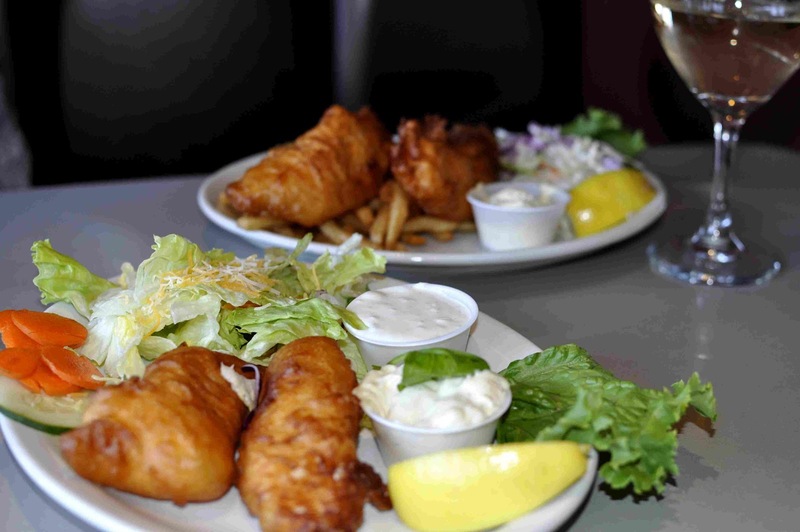 Here to test their claim as, “The Best Fish and Chips in Birch Bay,” we order their cod offering, leaving the halibut choice for another time. Al has chips and coleslaw that comes standard; Ruth requests a substitute garden salad ($11.99). Christine, our perky and cheerful waitperson, is attentive and knowledgeable. Water and wine (a refreshing 14 Hands Pinot Grigio in a generous six ounce pour–$6.00 each) keep us occupied while we wait for the kitchen to catch up with the less-than-over-whelming demands. We scan the spacious room where bright green and blue wooden chairs contrast with the mahogany booths and chairs. 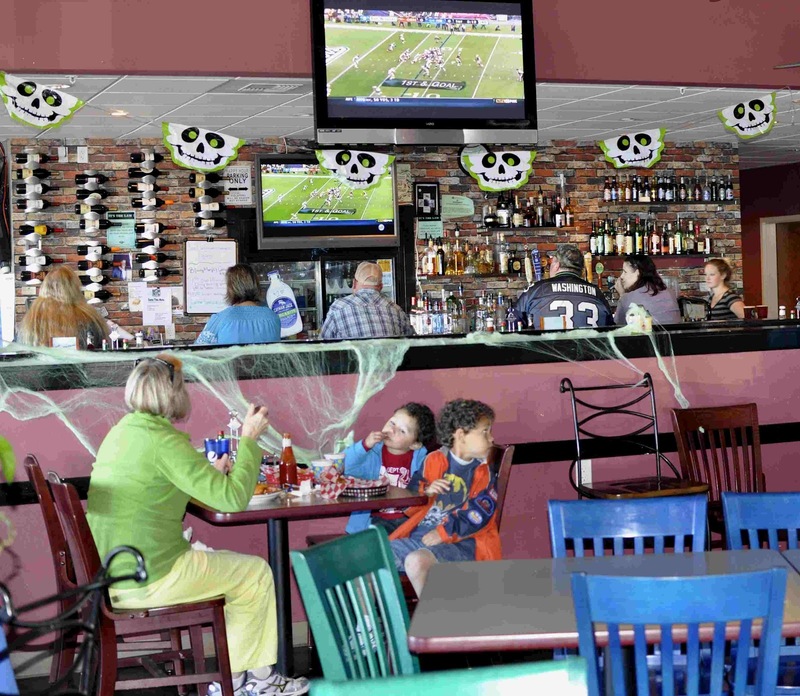 At least eight television sets keep the home-town crowd entranced as the Seattle Seahawks best the Carolina Panthers. Out bountiful platters arrive with two large portions of fish and healthy serving of chips and coleslaw and salad. The fish batter is crisp and browned on the outside, while slightly gummy on the inside. The cod is ideal, cooked not too much nor too little. The platter comes with a lemon wedge to complement the malt vinegar and ketchup available on the table. Shores does not have a declared splitting policy, but Christine assured us we could order one serving and she would provide an extra plate and tartar sauce. Because it is hard to check out the cleanliness of the kitchen, Ruth has always depended on the restroom as a measure of the overall sanitary practices. This one is clean and bright. As in many other places these days, the former hand-soap dispenser holes gape out of the counter; the soap is now dispensed by a motion-sensor wall device. Motion activated units also dispense paper towels. Al described the men’s room as adequately suppled and clean, although it would not make Achitectural Digest. 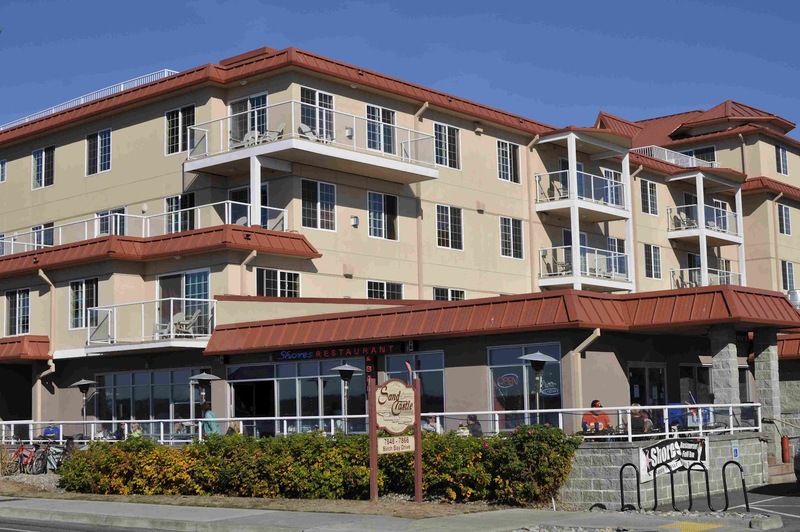 Patrons enjoy the panoramic bay view from the deck on this sunny October Sunday as well as from indoors. We relished our take-home portions the next day. Now the dilemma will be whether we split an order in the future or anticipate a second serving. “No, I’m the real thing,” President Obama said. We all laughed and the camera clicked, twice.